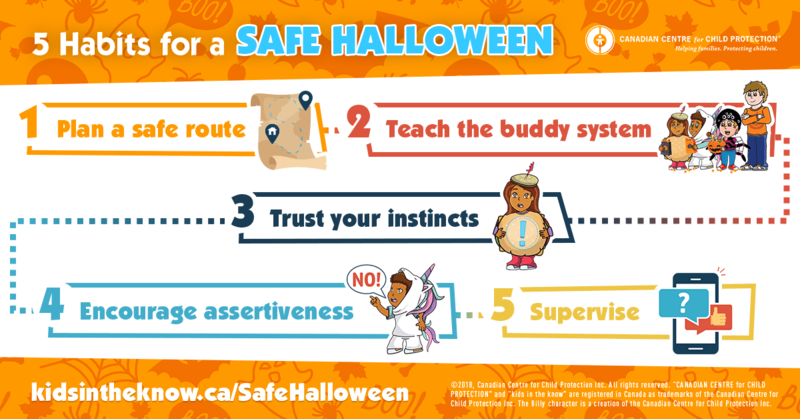 Before your students head out for an evening of trick-or-treating, review these important safety habits together. Encourage students to plan their trick-or-treating route out with their parent/guardian. For older students who may be trick-or-treating without an adult, remind them to stick to the route they planned out and avoid isolated areas and shortcuts, instead staying in familiar areas on well-lit streets where others are trick-or-treating. Have them identify safe adults within their neighbourhood who they can go to for help (e.g., a mother who is accompanying children, safe adults they know who live on their planned route). Teach young children about the buddy system. For children in Grade 2 or lower a safe buddy is someone who is old enough to supervise them (12+). Teach older kids to stick together while trick-or-treating – there is safety in numbers! Remind children of all ages to pay attention to their surroundings and to trust their instincts. Discuss safe ways to respond to a situation where they feel afraid or uncomfortable. These may include getting help from their buddy, calling a parent/guardian or going to a safe neighbour. Practice what-if scenarios with students. Teach children of all ages to set clear boundaries about personal limits. They should never go inside a home while trick-or-treating without checking with their parent/guardian first. If someone approaches them on the street andasks them to go somewhere with them, remind them not to go, run away and tell a safe adult what happened. Regardless of the reason, they should never go anywhere with anyone without checking with the adult who is in charge of them. When trick-or-treating, young children should be accompanied by an adult or someone 12+ who their parent/guardian assigns to supervise them. Teach young children to stay where they are and call out to their parent/guardian if they become separated while trick-or-treating. For older students who are trick-or-treating without an adult, encourage them to set a time with their parent/guardian when they will be home and to check in with them throughout the evening. Remind students to always check in before changing their plans or route. Share with your school/school district Facebook® and Twitter® followers. Print and send home with students. Post on your school/school district website. Send out to parents via your school notification system/app. Halloween is the perfect occasion for kids to use the buddy system. The Billy Halloween Game allows young children to practice picking a safe buddy, increasing the likelihood they will use the buddy system if they encounter a situation where they should take a safe buddy along. Note: The Billy Halloween Game is available online (Adobe® Flash Player required) or for use with a SMART Board®. “CANADIAN CENTRE for CHILD PROTECTION” and “kids in the know” are registered in Canada as trademarks; and “Billy Brings His Buddies” is used in Canada as a trademark; of the Canadian Centre for Child Protection Inc. The Billy character is a creation of the Canadian Centre for Child Protection Inc.